The Turducken will need to cook for approximately 9-10 hours at 225o F so begin preparation well in advance. The fowls can be deboned the day before and kept refrigerated overnight. Save the turkey carcass for making stock and some duck skin to render fat. We usually make the sausage stuffing the night before and store it in the refrigerator. We also bake a loaf of corn bread the night before, but wait until morning to mix the corn bread dressing together else it gets too soggy. Sharpen those knives! Maximize your work area so you have plenty of room and light. Use the kitchen table if there's not enough counter space. If it is your first time deboning a fowl, it is advisable to practice first on the chicken rather than the turkey since mistakes will be hidden inside the bigger birds. Rinse the turkey and remove the neck and any giblets. Place the turkey, breast side down, on a clean flat surface. Cut through the skin along the length of the spine. Using the tip of a knife and starting from the neck end, gently separate meat from rib cage on one side. Toward neck end, cut through the meat to expose the shoulder blade; cut meat away from and around the bone, severing bone at the joint to remove shoulder blade. Disjoint wing between second and third joints. Leave the wing bones and keep the wing attached to the meat. Continue separating meat from frame, heading toward the thighbone and being careful to keep the "oyster" (pocket of meat on back) attached to skin, rather than leaving it with the bone. Cut through ball-and-socket joint to release the thighbone from the carcass (bird will be open on one side, exposing bones left to deal with). Keep the leg attached to the meat. Repeat boning procedure on the other side of the bird. Carefully remove the carcass and use it to make stock. Stock is needed for making stuffing and more stock is needed for gravy. To make stock, put the turkey carcass in a large pot and cover with water. Bring to a boil, then simmer on low heat overnight. You should end up with a flat boneless (except for wings and legs) turkey with the skin intact in one large piece. Put the boned turkey in a large dish or bowl and cover with plastic wrap to keep it from drying out. Place it in the refrigerator. Repeat the deboning process on the duckling and the chicken. With these, you want to completely debone all legs and wings. Cut through flesh at the thinnest point and trim around these bones with a knife until they can be removed. (Since they have little meat, we usually cut off the entire wings and add them to the stock pot.) Both the chicken and duck will be stuffed inside the turkey and need not be kept "perfectly" intact. Trim excess skin and fat from the birds. Ducks, in particular, have a lot of excess fatty skin that should be saved to render fat to be used later for making gravy. We usually completely remove the skin from the chicken, but keep some duck skin which adds flavor. Prepare sausage stuffing and a similar amount of another stuffing such as corn bread stuffing. At least 10 to 11 hours before dinner, assemble the Turducken. Spread the turkey, skin down, on flat surface, exposing as much meat as possible. Rub 3 tablespoons of seasoning mix evenly on meat. 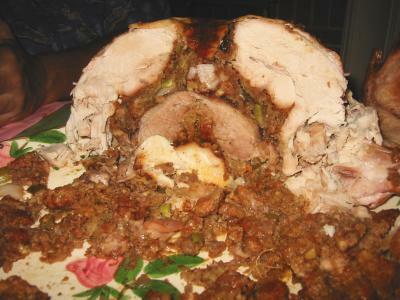 Spread sausage stuffing over the turkey in an even layer approximately 3/4 inch thick. Place duck, skin down, on top of stuffing. 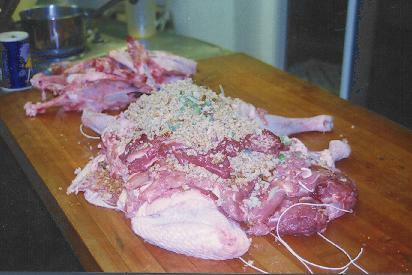 Season exposed duck meat with about 1 tbsp. of seasoning mix. Spread corn bread stuffing in an even layer (about 1/2 inch thick) over the duck. Arrange the chicken, skin down, evenly on top of corn bread stuffing. Season chicken meat with seasoning mix. Spread remainder of sausage and/or corn bread stuffing on top of chicken. The assemblage will look something like this. With another person's help, carefully lift the sides of the layered birds, folding the sides of the turkey together. 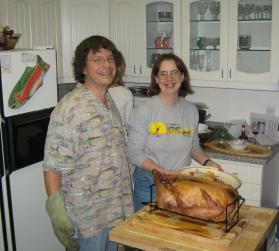 Have a helper hold the bird while sewing the opening down the back of the turkey together using cotton thread. The bird may not close perfectly, and a strip of cheese cloth can be used to help close the "crack" in the back of the turkey so stuffing will not leak out when the bird is turned over. 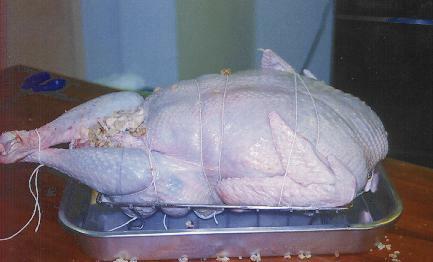 Since the turducken has no skeleton, it must be trussed up or it may fall apart in cooking. Tie 4-5 pieces of cotton string around the bird, widthwise to act as skeletal support. Turn the bird over and place in a roasting rack inside a large roasting pan so it is oriented breast side up and looks like a "normal" turkey. Tie the legs together just above the tip bones. Heat oven to 225 degrees F. Temperature control is critical since the turducken is so massive that it has to be cooked slowly at a low temperature to prevent burning the outside before the interior is cooked. Using an oven thermometer is highly recommended. We place 2-3 oven thermometers at different locations within the oven to monitor oven temperature. We also use a meat thermometer inside the bird to measure its internal temperature. Place the bird in the center of the oven and bake until a meat thermometer inserted through to center reads 165 degrees, approximately 9 hours, though cooking times will vary depending on the size of the birds and amount of stuffing used. Rely on temperature and not time cooked for doneness. There will be no need to baste, but accumulated drippings may need to be removed from the pan every few hours so that the lower portion does not deep fry in the hot oil. Save pan drippings for gravy. Remove the turducken from the oven and let cool in the pan for an hour before serving. Make gravy according to your favorite recipe. To serve cut bird in half. Carve crosswise so each slice reveals all 3 meats and stuffings. Will make 15 to 25 servings. Take 1 cup of pan drippings plus 1 cup of flour and cook over medium heat until "tan". Add 10 cups stock to fat/flour all at once. Whisk thouroughly. Bring back to a boil and then simmer for 5 min. Whisk constantly. Add salt + pepper + paprika "to taste". Another simple gravy variation is to use about a quarter to half cup of pinot grigio and about two to three tablespoons of instant potatoes instead of the flour. Test for taste and if it gets too thick add water or more pinot. The gravy can be made in advance and allowed to stand over low heat for at least 2 hours (maybe more). We usually make at least two batches.